﻿ Hardly Able Carriage Co. - Ohio. Find It Here. About Hardly Able Carriage Co. 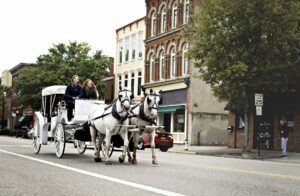 The carriage rides typically operate on Friday and Saturday nights between May and November. Customers can hitch a ride on a first-come, first-served basis.Rides originate on Front Street, across the street from Schafer Leather and in front of Mahone Tire, and take riders along Front and Greene Streets to Ohio Street. There the carriage rolls along the Ohio River on historic brick streets up to Fourth Street to Butler Street and back to the starting point, said Smith.The rides are not a guided tour, but rather a chance for people to sit back and enjoy the scenery, he said. The ride typically lasts 20 minutes and costs $35 per couple and $10 for each extra person. Children small enough to ride on a parents lap are free.